Sewing for clothes for babies and toddlers (of any age) is easy and fun. Maybe you have wanted something extra special but couldn’t find it at an online store? Maybe the price of that perfect sleeper is more than you can afford? Perhaps you’ve bought dozens of onesies but still haven’t found the perfect one that neatly hugs that padded bottom? Sewing it for yourself might be the answer! The good news is that sewing baby clothes isn’t especially hard. Anyone with average manual dexterity, a little patience and some spare time can teach themselves to sew and to make a variety of pretty baby clothes. Who knows? You may start out sewing from necessity but it may just turn into an enjoyable hobby. First you will need to get access to a sewing machine. You might be able to borrow one from a friend or a relative. Making an excuse about making a fur-suit, a Halloween costume, a costume for medieval reenactment or LARPing might be less embarrassing than admitting you really want to sew yourself a towering pile of cloth nappies. If there is no machine to borrow, you will need to buy a machine. I know, you probably wanted to learn to sew to save money, but sewing machines are getting cheaper. There are great deals to be had on eBay both for new and secondhand. Actually, older machines can be great – they are solid with less plastic than newer machines and can sew beautifully. If you decide to buy a machine, you don’t need anything flashy. A $1000-embroidery machine for sewing Disney Baby motifs can come much later. To start you just need a basic machine that can sew straight stitch, zigzag stitch, reverse and sew a button hole. If you also have plans to make a fur-suit, then you would be well advised to invest in a sturdier machine to deal with thicker fur fabric. If you have a chance to try a machine in a shop, the main thing to test is how smooth the machine is to operate. You want the machine to smoothly accelerate from idle to full speed. For a beginner there is nothing worse than a machine that just hums expectantly and then suddenly lurches into full speed. Also ask how the shop assistant how the thread tension is adjusted. Getting the thread tension right is essential to sewing a smooth, professional-looking seam. Get them to sew through some thick denim to see if it will work for projects like shortalls. Don’t be seduced by lots of fancy stitches; you are far better off with something that does the basics well than lots of silly stitches which you will never use. I see that beginner machines are available online for only $100 – I have never tried one of these and the online reviews are very mixed, especially in terms of control over the speed of sewing and reliability. I would definitely recommend testing these machines before buying. ALDI supermarkets, if you have then in your part of the world, routinely have sewing machines (and overlockers) on their special offer table. Like most of the products sold by ALDI, these machines apparently punch far above their price. Check Costco too, as you might get a good deal there for one of the cheap, entry level machines. Fabric Scissors – a nice solid set of shears will make cutting out much easier. Keep them only for cutting fabric. No paper! And don’t let your brother use them for stripping insulation or making chain mail! Paper Scissors – You’ve probably already got a pair of scissors that you can use for cutting paper patterns. Keep them handy and you won’t be tempted to use your fabric shears. Seam Ripper – OK, everyone makes mistakes, but at least in sewing, with one of these little fork shaped knifes you can undo those mistakes and try again. Hand needles – There is often some finishing that will need hand sewing. Get yourself a packet of assorted sharps. Marker – I love these temporary blue or purple fabric markers that make marks that fade out when you wet them. It’s sort of like reverse invisible ink. Buy one of those and also get yourself a tin of tailor’s chalk for marking dark fabric that a fabric marker won’t show on. Pins – You will need a packet of dress making pins. Tape Measure – A fabric tape measure is invaluable for taking measurements and laying out a pattern. If you plan on following any of my patterns make sure your one has a metric scale, as I won’t use imperial. Thread – you will always need white and black thread. Buy two big reels of polyester thread to keep in your sewing kit. You will also need matching thread for each project. Iron – You probably already have one of these. Yardstick – not essential, but a long straight ruler will help you mark patterns. Embroidery Scissors – A small set of scissors for trimming threads. Extra bobbins to fit your machine. 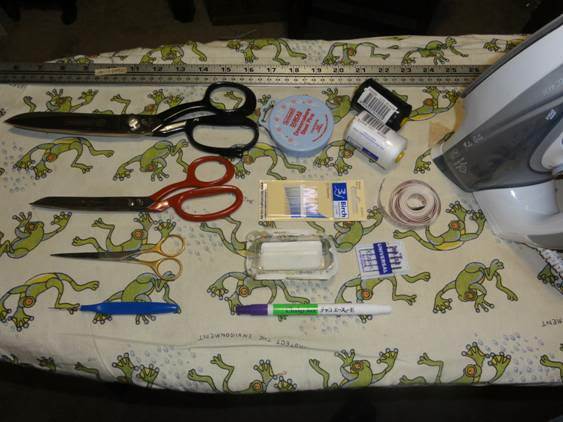 There are some great resources online for teaching basic sewing skills. There is no need for me to reinvent the wheel. Just search - you’ll find heaps of wikis, forums and YouTube tutorials. Here is a very fine page on using a sewing machine for the first time. Alternatively, you could start like I did: I got my mum to help me make a costume for medieval reenactment. All the skills I learned from mum about cutting out, sewing and finishing clothes I applied for my own means when my parents were away. Of course, if you are especially disciplined, there are plenty of places where you can take classes on basic sewing. Even with all of this online training, there are some simple skills, tricks and things to remember that I will highlight. I will be brief because I expect you will use other resources to get all the good oil. Did you put the presser foot down? Is the machine properly threaded? Is the bobbin thread correctly coming out of the needle slot and running towards the back of your work? Is the bobbin correctly threaded? The bobbin spool needs to be inserted the right way, so that the thread comes out of the bobbin case on the correct side. Have you got the needle inserted correctly? The machine needle has a flat part and a rounded part on the shank. This needs to be the right way round, generally with the flat part towards the back. Are you pulling at your work as you sew? You should just let the machine feed the work through rather than try to pull it. Have you adjusted the thread tension right? A machine stitches by having one thread running along the bottom of the fabric, and another thread on the top that passes through the needle hole in the fabric and loops around the bottom thread. (I still can’t get my head around the topology of organizing that; I think it’s done through the black arts). The tension knob adjusts the vertical height where the little knot sits in the seam. Too much tension or too little tension and the knot will protrude out of the seam and the seam will look ugly. Adjust the tension so the knot sits in between the two pieces of material. Is you needle blunt or bent? You might see that you are pulling threads in the material you are sewing. Change your needle. Remember to put it in the right way. Did you clip and press your seam? If your seam goes around a curve or a corner you will need to clip the seam to allow it to sit flat when you turn your fabric to the good side. Did you press your seam? After you have stitched remember to iron over the seam. This will allow the stitching to bed into the fabric and give it a much better finish. Sure, it takes time, but will be worth it in the long term. Depending on the fabric you use, when you sew a seam, you will need to finish it in some way. Otherwise during laundering your beloved garment will quietly unravel. If you are using polar fleece fabric, you won’t need to finish the edges, as this stuff doesn’t unravel, but if you are sewing anything else, any cut edge will need to be stabilized. The method I mostly use is to zigzag over the edge. I will demonstrate this later in some of my project pages. Other methods to stabilize an edge include pinking (not appropriate for baby clothes), French seams (what a hassle) and overlocking (needs a separate, expensive machine). Good Side to Good Side – when you sew a standard seam you need to place the “good sides” together, so that when you fold the material out the seam is hidden. Keep your fingers clear from the needle. Remember needles sharp! If the machine jams, work out what the problem is, don’t try to carry on. Don’t ever try to sew without fabric under the needle. The machine will immediately tangle. Don’t forget to add seam allowance to your pattern pieces. We will discuss this later in the projects.